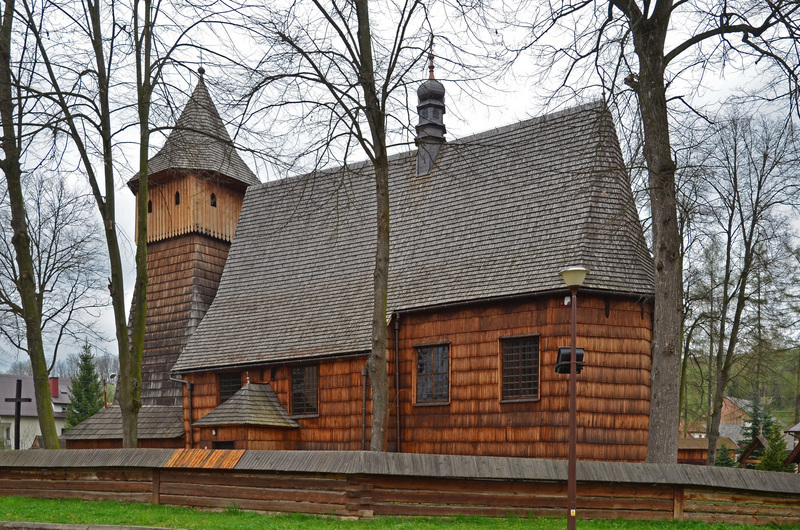 Wooden Architecture Route, was established in 2001 with the initiative of the authorities of Lesser Poland region (Malopolska) and neighbouring regions. 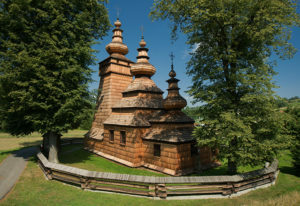 The main goal is to preserve a great artistic and historical value of 253 architectural ensembles included in the Route in Lesser Poland alone – from Catholic and Eastern Orthodox churches, chapels and belfries to granaries, country cottages and noble mansions, of which eight are listed as UNESCO World Heritage Sites. 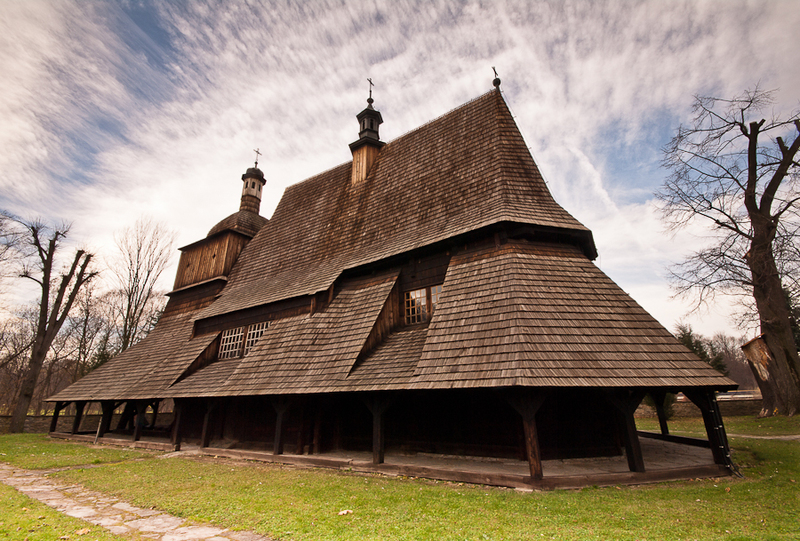 In Lesser Poland, Wooden Architecture Route has a length of more than 1500 km. It has been divided into four smaller parts. Each route covers a large number of unique wooden buildings located within a small distance from each other. 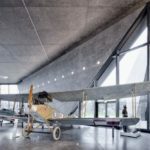 This allows visitors to see as much as possible, at the same time having a chance to contemplate and compare objects and find the most interesting details of the traditional architecture of Lesser Poland. Eight churches are listed as UNESCO World Heritage Sites. Such recognition proves an unmatched value of wooden architecture in Lesser Poland region. It is a Catholic church from around 1500. 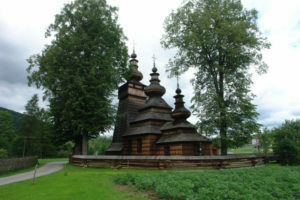 The church was built using horizontal logs of fir wood. The characteristic feature is a tapered tower with overhanging ribbon, topped with a pyramidal helmet. Beneath the tower there is a large vestibule. 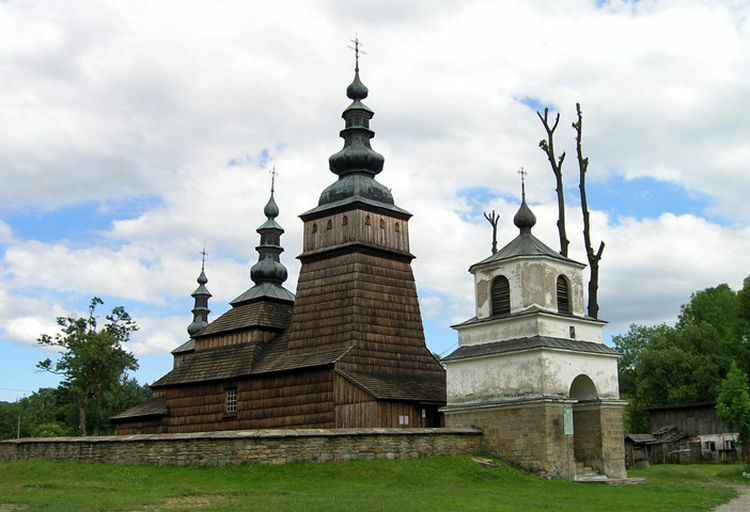 The tower of St. Michael Archangel’s Church in Binarowa is the oldest known wooden church tower. The details of the interior are preserved in great condition. They include a Gothic sculpture of Virgin Mary with Child from around 1380, a Crucifix from around 1525, a stone baptismal font from the early 16th century and a main altar from the early 17th century. St. Michael Archangel’s Church in Debno was built in the second half of the 15th century. 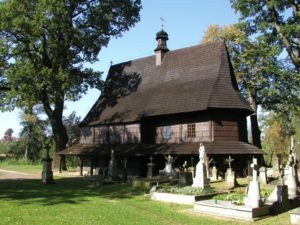 It is probably the second oldest wooden structure after the tower of the church in Binarowa, and is one of the best kept wooden Gothic churches in Poland. St. Michael Archangel’s Church in Debno resembles the one in Binarowa when it comes to shape and structure. Inside, there is a unique polychrome interior from around 1500, which makes it the oldest polychrome made in wood in Europe. Probably the oldest element of the interior is the Crucifix dating back to 1380. 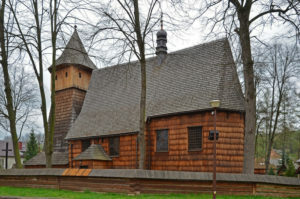 St. Leonard’s Church in Lipnica Murowana has remained almost unchanged until today and is one of the most valuable wooden Gothic churches in Poland. It was most probably built at the end of 15th century, but according to local tradition, it dates back to 1143 or 1203 – such a date is inscribed on the north-eastern wall of the chancel. In line with the old tradition, windows are only on the south wall and entrance doors are located to the south and west. 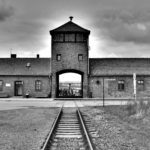 The north was identified with evil forces. The church is richly decorated with polychrome. Paintings in the chancel come from 1689 and depict the Crucifixion, the Last Judgement, the Last Supper and the image of Virgin Mary adored by Saint Szymon of Lipnica. In the nave, on the north wall, there is polychrome from 1711. The decoration of the choir consists of a folk visual expression of the Decalogue. This church is often referred to as the architectural pearl of the region due to its characteristic exterior. It was built around 1520 using larch logs covered with wood shingles. 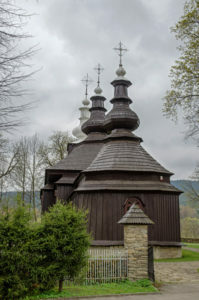 In the 17th century, the church was rebuilt and during that time its most distinctive feature was added – the so-called soboty, a type of wooden gallery supported by pillars and topped with steep roof, accessible from the grounds. The interior is rather poor because the church was severely devastated during wartime at the turn of 1914-1915. However, there still are noteworthy elements, such as a stone baptismal font from 1522 or Folk-Baroque paintings of the Way of the Cross from the 17th century. Saints Philip and James Church in Sekowa has been awarded a number of commendations for exemplary conservation works. Now it is a Catholic church, but initially, St. Michael Archangel’s Church in Brunary was built as a Uniate parish church in 1616 (at the end of 16th century the so-called Uniate Church in Poland decided to separate from the Eastern Orthodox Church and recognise the authority of Rome; known as Greek Catholic Church). 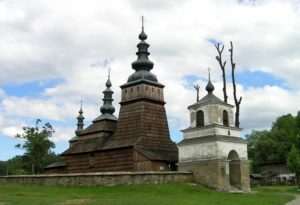 Eastern churches are called tserkhvas (in Polish cerkwie). The tserkhva in Brunary was built in three stages – the present state dates back to 1831. It was taken over by the Catholic Church after the 1947 forced resettlement of Ukrainian minority – a controversial operation carried out by the Soviet-installed Polish communist authorities against Ukrainian guerilla activities. The church has a very characteristic tower that covers vestibule, with a helmet crowned with a forged cross. Similar helmets are found above the aisle and the chancel. Inside there is a Baroque, 18th-century iconostasis. Polychromy covers the entire ceiling and inner walls of the church. It was made in stages between the 18th and 19th centuries, kept in blue tone, with grapevines motifs. St. Paraskevi’s Church in Kwiaton is considered to be the most beautiful of its kind. It was erected on a plan of three conjunct squares – a large chancel, an aisle and a narthex. The three parts of the structure are also evident in the exterior – from the lowest chancel, by the singled aisle to the dominating tower. Each part of the building is covered with a separate roof. This church was also initially a tserkhva, built in the second half of the 17th century. Most of the equipment inside comes from the 19th and early 20th century. The chancel is separated from the nave with 1904 iconostasis. In the vestry is kept an epitaphios, a representation of the dead Christ made on richly decorated cloth. The church was taken over by the Catholics after 1947, but now it is shared by both, Roman and Greek Catholic Churches. Built in 1653 as the Greek Catholic parish tserkhva. The current state is a result of the 18th- and 19th-centuries changes. After the reconstruction the chancel and the nave have equal width. Shingled roofs over the three parts of the church are crowned with helmets with lanterns and crosses. Inside there is an 18th-century iconostasis painted in blue, red and gold, decorated with openwork columns with grapevines motifs. It was made by artist Jan Medycki, who worked in both Catholic churches and Orthodox tserkhvas. The icons are strongly influenced by Western Baroque art. 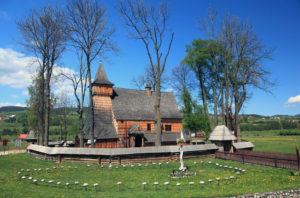 After 1947, Protection of Our Most Holy Lady Church in Owczary was turned into a Roman Catholic temple as a result of forced resettlement of Ukrainian minority. However, a decade later some of the migrants returned to the village and occasional Greek Catholic services were also celebrated in the building. Now, it is a shared Roman and Greek Catholic parish. The church in Powroznik dates back to 1600, but only a part of the original building, now a sacristy, was preserved until today. The present state of the church, which initially was a Greek Catholic tserkhva, was formed between the 17th and 18th centuries, with the last reconstruction in 1813. The church was then moved from its former location to a place slightly higher due to the flood threat. Above the vestibule there is a typical tower, with a wooden helmet and a forged cross. In the tower there is an original bell from 1615. The smaller tower is located above the aisle, covered by a tent roof. Windows are located only on the southern wall. The inner walls are decorated with polychromy made around 1607. The iconostasis dates back to the 18th century, but because the tserkhva was adapted as a Roman Catholic church after 1947, the iconostasis was cut into several pieces, located in different parts of the chancel. 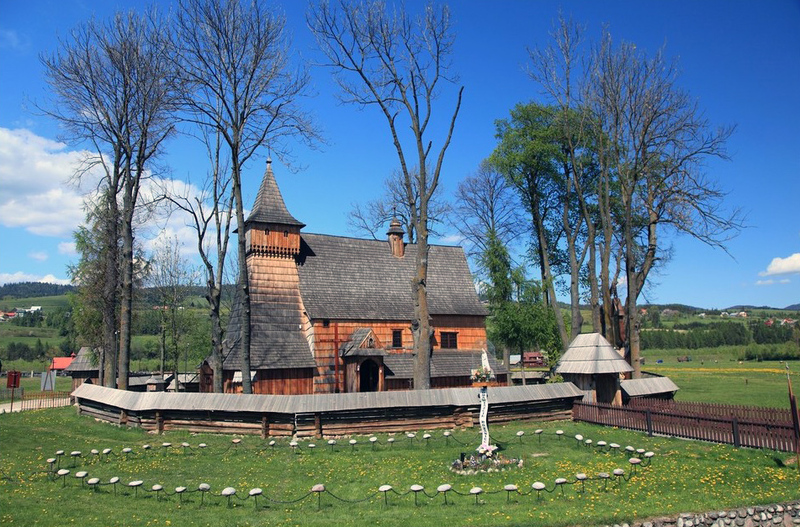 The entire 1500-km-long Wooden Architecture Route in Lesser Poland is divided into four parts. Each part covers the most beautiful wooden buildings in different areas of the region.